Being involved in pro bono work as a student can be a great experience. You may be looking towards a career with a social justice focus (for example, working in a community legal centre, legal aid, pro bono clearing house or referral scheme, or a law firm pro bono practice), or you simply have a passion for social justice. What are some of the benefits of getting involved in social justice? connections with the local community. Pro bono legal work is also recognised for the purpose of the pre-admission Practical Legal Training requirement. You can get involved in a number of ways, which are described in more detail in Social Justice Opportunities. 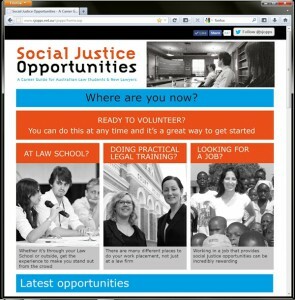 Social Justice Opportunites is a guide produced by the Centre and the Australian Law Students’ Association for students and new lawyers on how to volunteer and find employment in the social justice sphere. You can also follow SJOpps on Twitter or like it on Facebook to keep up to date on job and volunteering opportunities. enrolling in a clinical legal education program at your university. doing it without getting any kind of fee, reward or academic credit. It’s a great introduction for students to the ethical responsibility of lawyers to contribute their services. For more information please see our dedicated What is pro bono? 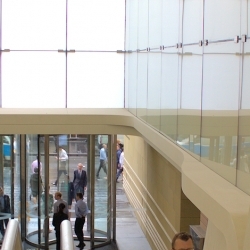 page in the Information on Pro Bono section of this site, or contact the Centre. Karen volunteered at a community legal centre. The CLC gave her training and supervision so she could answer calls from a wide variety of clients and write case summaries on client contact forms. She also ended up helping with filing case documents and working with other students and solicitors doing legal research into clients’ cases. After a few months at the CLC, Karen had developed practical skills in client communication, case management, teamwork and legal research, and understood how a legal office works, which were all skills that made her attractive to future employers. But the best thing according to Karen was that she felt like she had made a positive difference to the lives of disadvantaged people.